Discounts are available for 2'-O methyl bases! 2�-O-Methyl bases are classified as a 2�-O-Methyl RNA monomer. 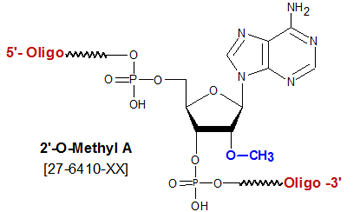 2�-O-Methyl nucleotides are most commonly used to confer nuclease resistance to an oligo designed for anti-sense, siRNA or aptamer-based research, diagnostic or therapeutic purposes, when specific 2�-OH is not required. Nuclease resistance can be further enhanced by phosphorothiolation of appropriate internucleotide linkages within the oligo. The hydrogen bonding behavior of a 2�-O-Methyl RNA/RNA base pair is closer to that of an RNA/RNA base pair than a DNA/RNA base pair. Consequently, the presence of 2�-O-Methyl nucleotides improves duplex stability. Indeed, incorporation of a 2�-O-Methyl nucleotide into an anti-sense oligo (resulting in a 2�-O-Methyl RNA/DNA chimeric), lead to a increase in the Tm of its duplex with RNA, relative to that formed by an unmodified anti-sense DNA oligo, of 1.3�C per 2�-O-Methyl RNA residue added (2). Moreover, from a synthesis standpoint, the coupling efficiency of 2�-O-Methyl phosphoramidites are higher than those of RNA monomers, resulting in higher yield of full-length oligos. 1. Cotton, M.; Oberhauser, B.; Burnar, H. et al. 2�O methyl and 2�O ethyl oligoribonucleotides as inhibitors of the in vitro U7 snRNP-dependent messenger-RNA processing event. Nucleic Acids Res. (1991) , 19:2629-2635. 2. Kawasaki, A.M. et al., Uniformly modified 2'-deoxy-2'-fluoro phosphorothioate oligonucleotides as nuclease resistant antisense compounds with high affinity and specificity for RNA targets, Journal of Medicinal Chemistry (1993), 36: 831-841.